In 2014, the New York Times (10/12/14) ran a major investigative piece by reporter James Risen about several billion dollars gone missing, part of a shipment of pallets of $12 billion–$14 billion in C-notes that had been flown from the Federal Reserve into Iraq over a period of a year and a half in an effort to kickstart the Iraqi economy following the 2003 US invasion. Risen reported that about $1.5 billion of the cash, somehow stolen, had been discovered in a bunker in Lebanon by a special inspector general appointed to investigate corruption in the US occupation of Iraq. The article got front-page play. These stories are basic Journalism 101, the kind of bread-and-butter reporting on government that one expects from a major news organization. So how to explain that neither of these prestigious and influential newspapers—or practically any of the corporate media in the US, for that matter—bothered to mention it when the Pentagon’s inspector general this year issued a report blasting the US Army for misreporting $6.5 trillion (that’s not a typo; it’s trillion with a T) as its spending total for the 2015 fiscal year. Now, clearly that number cannot be correct, since the entire Pentagon budget for 2015 was a little over $600 billion, or less than 10 percent of what the Army was saying it had spent. The Office of the Assistant Secretary of the Army (Financial Management & Comptroller) (OASA[FM&C]) and the Defense Finance and Accounting Service Indianapolis (DFAS Indianapolis) did not adequately support $6.5 trillion in year-end JV adjustments made to AGF data during FY 2015 financial statement compilation. The unsupported JV adjustments occurred because OASA(FM&C) and DFAS Indianapolis did not prioritize correcting the system deficiencies that caused errors resulting in JV adjustments, and did not provide sufficient guidance for supporting system‑generated adjustments. As a result, the data used to prepare the FY 2015 AGF third quarter and year-end financial statements were unreliable and lacked an adequate audit trail. Furthermore, DoD and Army managers could not rely on the data in their accounting systems when making management and resource decisions. There’s a lot of jargon and a lot of use of DOD acronyms in there, but the key point that makes this story newsworthy is the last sentence (as well as the alarming bit about 16,500 missing records). 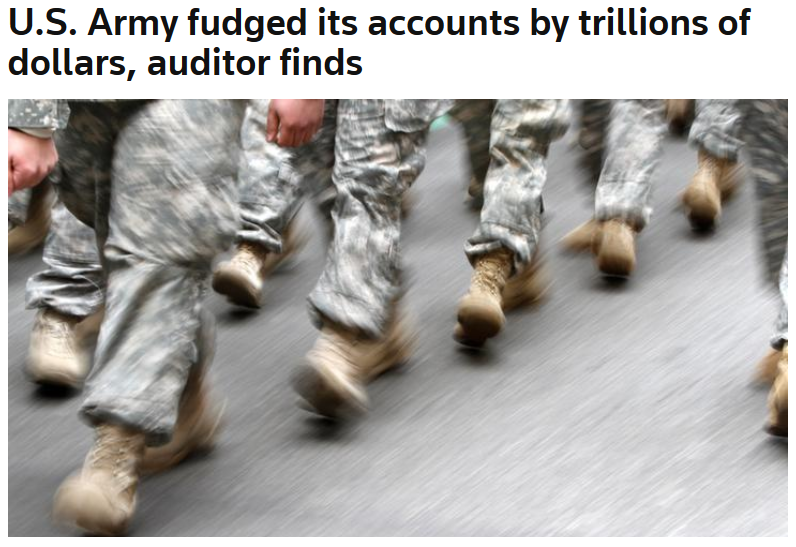 If the Army is making up numbers—and that’s exactly what “unsupported adjustments” means to an accountant—then nobody, not a reporter, not a congressional oversight committee, not even an inspector general, can tell what allocated funds are actually being spent on, where the money really went, whether programs are cost-effective, or even whether funds were misused or stolen. And we’re talking about the single biggest department in the US government, which accounts for more than one-half of all discretionary federal spending each year. For clarification, these numbers reflect changes made in Fiscal Year 2015…. These adjustments do not adjust the budget amount for the Army. The dollar amounts are possible because adjustments are made to the Army General Fund financial statement data throughout the compilation process for various reasons such as correcting errors, reclassifying amounts and reconciling balances between systems. The general ledger data that posts to a financial statement line can be adjusted for more than the actual reported value of the line. For example, there was a net unsupported adjustment of $99.8 billion made to the $0.2 billion balance reported for Accounts Receivable. Remember, this is just a report on the Army’s budget. It turns out that the same kind of indecipherable, fantastical and unauditable accounting is being done by the Navy, the Air Force and the Marines. 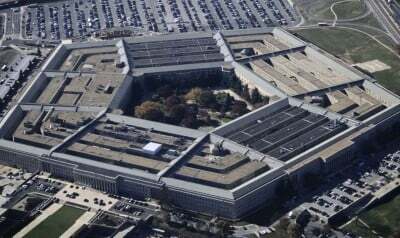 Reuters (8/19/16) had one of the few media reports on the Pentagon’s mammoth accounting errors. “Where is the money going? Nobody knows,” said Franklin Spinney, a retired military analyst for the Pentagon and critic of Defense Department planning. The significance of the accounting problem goes beyond mere concern for balancing books, Spinney said. Both presidential candidates have called for increasing defense spending amid current global tension. An accurate accounting could reveal deeper problems in how the Defense Department spends its money. Its 2016 budget is $573 billion, more than half of the annual budget appropriated by Congress. The thing is, the Pentagon has been at this dodgy game for decades. In 1996, Congress passed a law requiring all federal agencies to comply with federal accounting standards, to produce budgets that are auditable and to submit an audit each year. At this point, two decades later, the Pentagon has yet to comply with that law, and therefore cannot be audited. It is the only federal agency that is not complying or, the IG’s report suggests, even trying to comply. One would think that would be newsworthy, but apparently for the major newsrooms of the US, not so much. The failure to take up this important story reflects, at a deeper level, the power of the Pentagon and the unwillingness of the media or politicians to challenge it. Only power and the derived conflicts of interest can explain this remarkable ability of the Pentagon to avoid a legally required audit. Requests for comment from the New York Times and the Washington Postabout their non-coverage of this $6.5-trillion Pentagon scandal went unanswered as of press time.